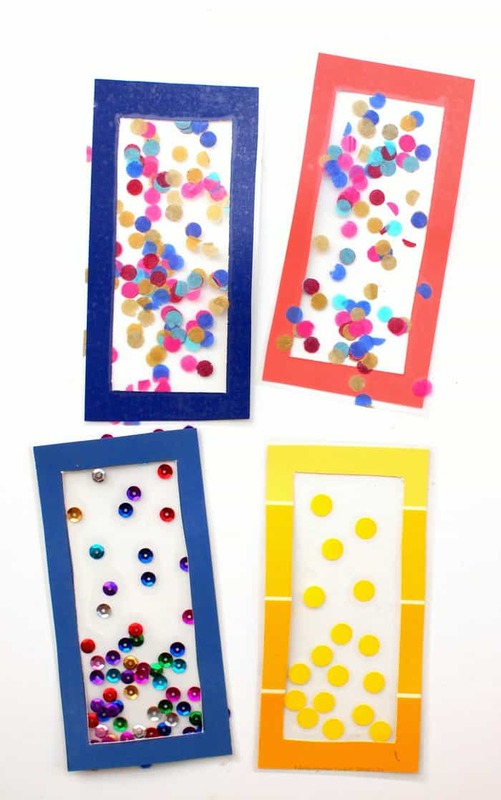 Your kids are going to love making these DIY bookmarks with a twist – just add paint chips and confetti made from tissue paper. So easy! Skills Required: None. Any skill level can make these bookmarks, even if you’ve never crafted before. 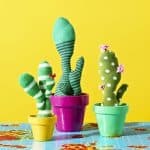 I would say this project is great for kids ages 3 and up – and adults too, of course! Looking forward to the new school year? I sure am! Every year I do a happy dance around the end of August because I love seeing all the cute new designs for backpacks, notebooks, and pens. Hi! It’s Leslie from Pink Stripey Socks. 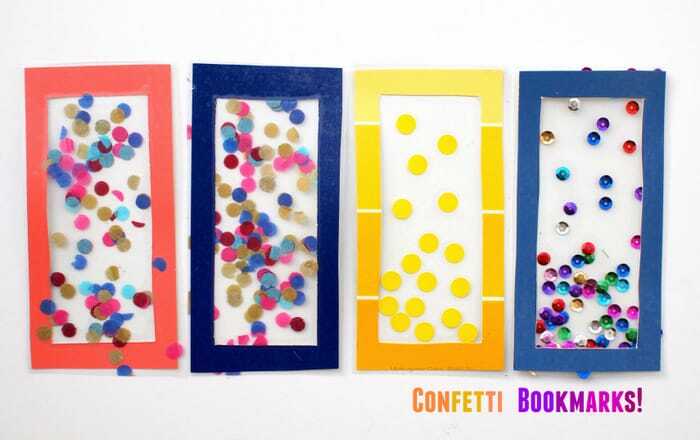 Today’s craft is school themed to celebrate the arrival – we’re making Confetti Bookmarks! Hooray! My son enjoyed these cat bookmarks and these paint chip bookmarks so much that we decided to make an additional set of bookmarks for kids . . . this time in a different style. 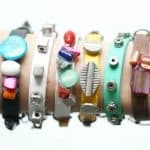 This is a pretty cool bookmark craft because you probably already have the supplies in your stash – perhaps with the exception of the clear contact paper. BUT you’ve got a few options for supplies. 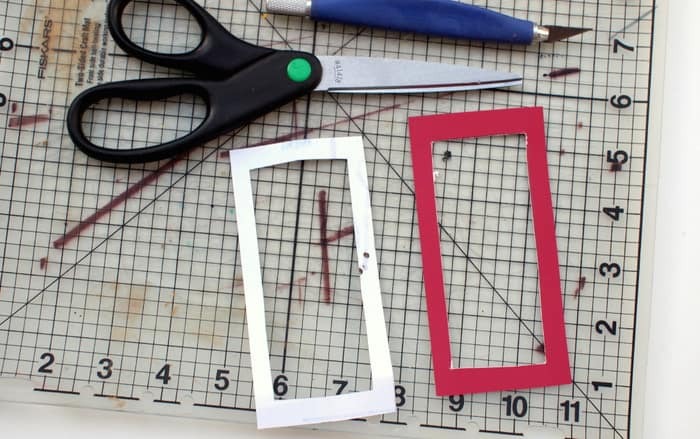 For the frame of the bookmark, you’re going to use some sort of sturdy paper – you can choose cardstock, scrapbook paper, or even paint chips. You just want something that is going to provide a bit of a stable frame so that your bookmark lasts. For the clear portion of the bookmark in the center, you’re going to use contact paper. I do have a little tip for you though – if you don’t have contact paper readily available, use clear packaging tape! I had luck finding clear contact paper at Dollar Tree, and I saw it at Target too. The nice thing about the contact paper is that it doesn’t have any lines, because you can use continuous piece. Makes for more of a clean DIY bookmark. 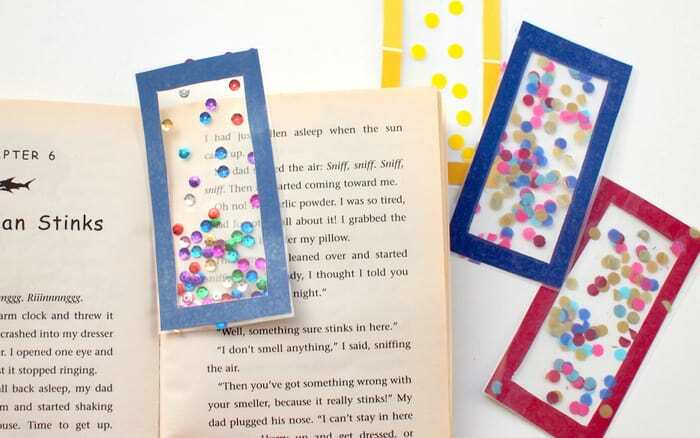 Ready to make your own DIY bookmarks? Let’s go! 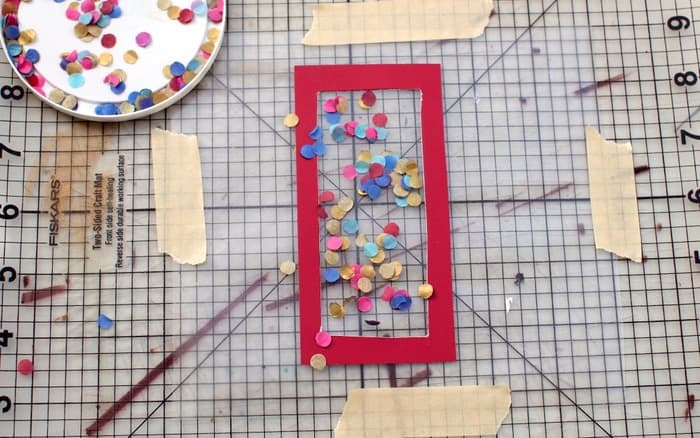 Let’s create confetti! Grab several sheets of tissue paper and fold them together (I folded about 10 sheets in half). 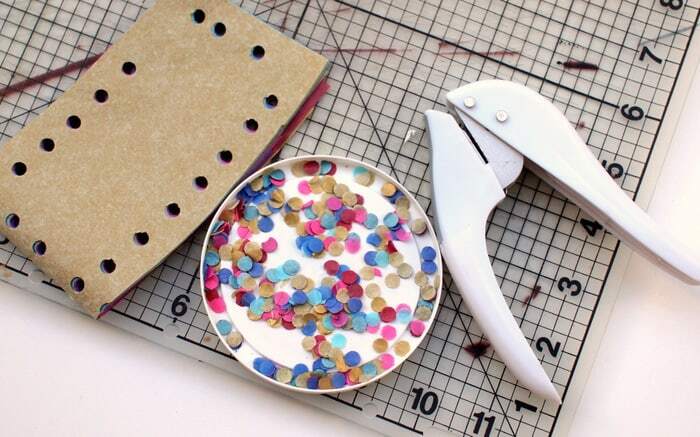 Then, use your hole puncher to create confetti. 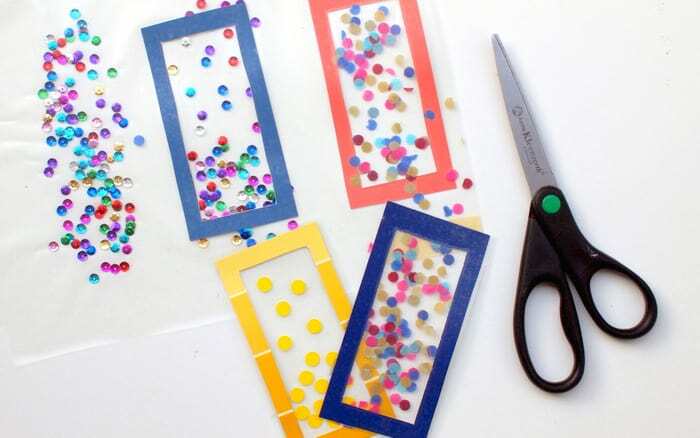 Alternatively, you can also use construction paper or scrapbook paper to create confetti too! I just happened to have tissue paper on hand. Now let’s create the border for your bookmark. Cut out a bookmark template from a regular sheet of paper. 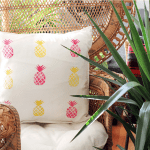 Then, trace and cut out your template using a colorful paint chip or other sturdy sheet. Cut out two pieces of clear contact paper. Make the second sheet slightly larger than your first. 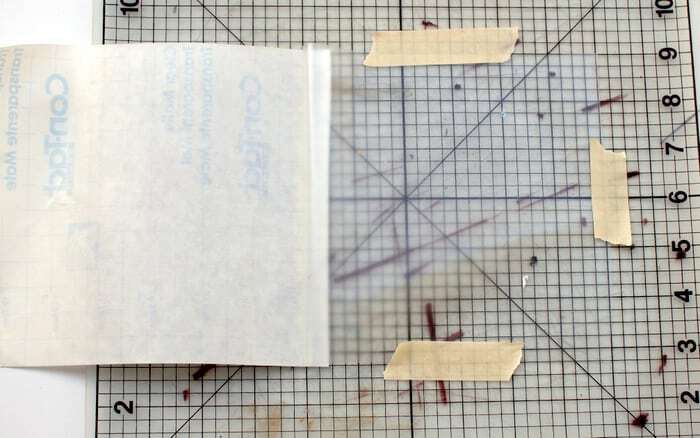 (Having a larger second sheet helps you to easily cover the first sheet of contact paper.) 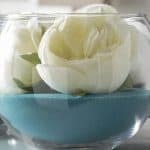 Peel off the backing and tape the smaller sheet of contact paper, sticky side up, onto your work surface. Gently stick on your bookmark border. Then, sprinkle on your confetti! Your bookmarks for kids are nearly complete. Once you’re done, peel off the backing from your second sheet of contact paper and carefully stick it to your first. Then, cut out your bookmarks! Trust me, you’re not going to stop at making just one. Soon you’ll have a bunch of colorful, confetti bookmarks to celebrate your love of reading and the start of the school year!